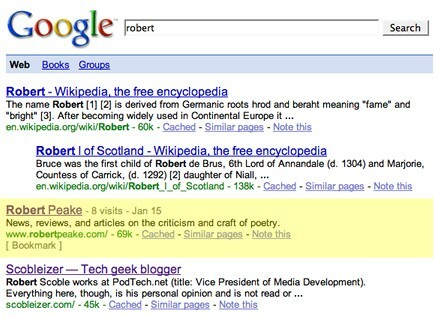 Last night, I was ego surfing, and decided to check my Google rank for the keyword "Robert." That's right, just "Robert." I have been in the top ten off and on, but last night this site actually came up higher than the blog of Robert Scoble. I think this means I was momentarily famous. Strangely enough, I didn't feel any different than before. By this morning, the effect wore off. I am now back under Scoble. Such are my thrills of late. I also started up a stub page on Wikipedia for my googleganger, Robert Peake the Elder. Some art historian with a lot of spare time later went to town. Unfortunately, the Peake side of my family tree ends with my love-em-and-leave-em great-grandfather Peake. So, short of DNA testing (or some evidence that this painter had a double-jointed thumb), I'll never know if we are related. Categories: Life and Technology. Tags: Robert Peake The Elder and Robert Scoble.